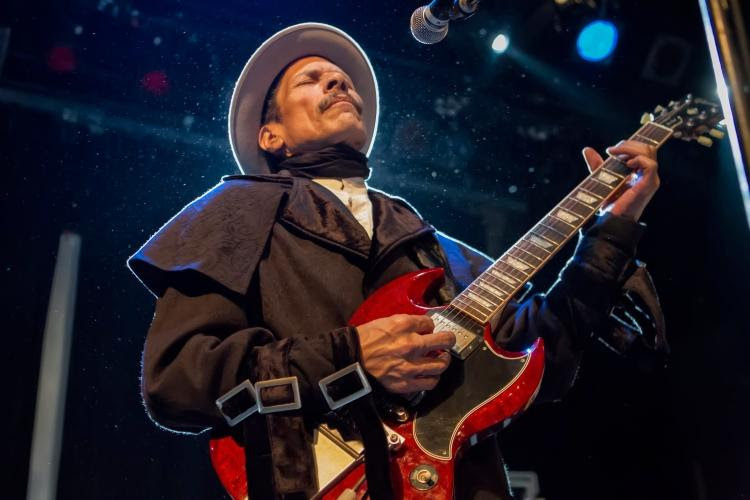 Though most known for his soulful songwriting and gentle croon as heard on blockbuster hits such as “Strawberry Letter 23” and “Inspiration Information,” Shuggie Otis has long been held as one of the most innovative and tasteful guitarists to ever pick up the 6-strings, the “heir to Hendrix” as he is often called. A guitar-playing prodigy from an early age, Shuggie performed on stage and in the studio alongside his legendary father, bluesman Johnny Otis. Now, Shuggie has a new project that showcases just how mindblowing he can be on the pearly frets of his gorgeous maroon Gibson SG, an adventurous new fusion rock project called Inter-Fusion. The album consists of mostly instrumental tracks that groove and weave, taking unexpected turns in surprising directions but all anchored by one of the finest rhythm sections imaginable featuring drummer Carmine Appice (of Vanilla Fudge and Beck, Bogert & Appice) and bass player Tony Franklin (of The Firm and Roy Harper). In addition, keyboardist Kyle Hamood (of local L.A. rockers Them Guns) steps in as both a musician and producer of the album bringing the absolute best performances possible out of each player.